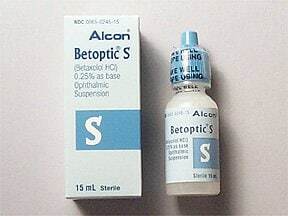 What conditions does Betoptic S Suspension, Drops (Final Dose Form) treat? Tell your doctor right away if any of these unlikely but serious side effects occur: eye pain/swelling/discharge, vision changes, increased eye sensitivity to light, swelling of the ankles/feet, tiredness, slow/irregular heartbeat, muscle weakness, mental/mood changes, hair loss, blue fingers/toes, cold hands/feet. List Betoptic S Suspension, Drops (Final Dose Form) side effects by likelihood and severity. This medication should not be used if you have certain medical conditions. Before using this medicine, consult your doctor or pharmacist if you have: certain types of heart rhythm problems (e.g., sinus bradycardia, second- or third-degree atrioventricular block), certain serious heart conditions (cardiogenic shock, severe heart failure). Before using this medication, tell your doctor or pharmacist your medical history, especially of: diabetes, low blood sugar levels (hypoglycemia), overactive thyroid (hyperthyroidism), muscle weakness disorders (e.g., myasthenia gravis), breathing problems (e.g., asthma, chronic obstructive pulmonary disease-COPD), heart failure (treated, stable type), low blood flow to the brain (cerebrovascular insufficiency), poor blood flow to the hands/feet (Raynaud's phenomenon), severe allergies. What should I know regarding pregnancy, nursing and administering Betoptic S Suspension, Drops (Final Dose Form) to children or the elderly? Before using this medication, tell your doctor or pharmacist of all prescription and nonprescription/herbal products you may use, especially of: drugs for high blood pressure (e.g., clonidine, reserpine, oral beta blockers such as propranolol, calcium channel blockers such as diltiazem), epinephrine, fingolimod. Does Betoptic S Suspension, Drops (Final Dose Form) interact with other medications? Do not flush medications down the toilet or pour them into a drain unless instructed to do so. Properly discard this product when it is expired or no longer needed. Consult your pharmacist or local waste disposal company for more details about how to safely discard your product.Information last revised April 2017. Copyright(c) 2017 First Databank, Inc.
Are you taking Betoptic S Suspension, Drops (Final Dose Form)? Are you considering switching to Betoptic S Suspension, Drops (Final Dose Form)? 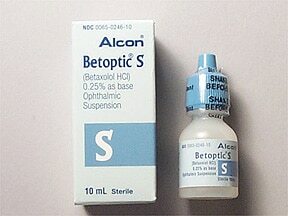 How long have you been taking Betoptic S Suspension, Drops (Final Dose Form)?